If you see yellow signal, start to slow down, the next signal is likely to be red and you must stop in front of that. Drive cautiously. The trick to mastering any route is learning it, where the landmarks, breaking points, signals and stations are, so drive at half speed until you get a feel for the route. Practice stopping at stations. Pick any passenger service and get up to the line speed. Then work out the best place to start braking taking careful note of landmarks such as trees, houses, rivers, bridges, etc. As a rule, you want to aim to be at below 30mph when you reach the start of the platform. You can use the precision cursor (mouse on PC) to hover over each control and switch to learn the layout of each locomotive cab. If you find yourself on the tracks needing to get back onto the platform, you will find steps to climb up at regular intervals; climbing aboard locomotives from track height can be done in the same manner. What top tips do you have for fellow drivers? Head on over to the Dovetail forums and join the discussion, share your experiences, and learn more about Train Sim World. Start off by playing the HST tutorial, this will load automatically when first launching Great Western Express, this will teach you the basics of how to start and get the HST moving. Once you have done this, give the ‘West World’ scenario a spin to test out and expand your newfound skills. Now that you’ve had a go at the HST, why not try out the other passenger traction, the Class 166; again, the tutorial is the best place to start as each cab is quite different in layout and operation. After getting to grips with the Class 166, have a go at the ‘Down the Line’ scenario, this offers a trio of commuter flavours where you can choose between 3 different journeys, perhaps start with the shortest and work from there? 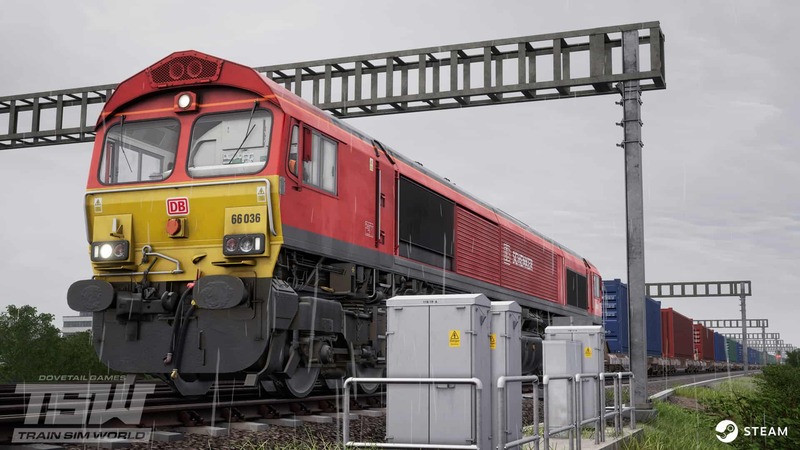 The Class 66 offers a contrasting freight experience so learning to drive that in its tutorial is the next natural progression, before going all out in the ‘Aggregate Industries’ scenario where you can see how wagons are unloaded. And, to bring everything around full circle, the ‘Drag Line’ scenario sees you take control of a Class 66 and rescuing a failed HST! All that, and we haven’t even touched service mode, from where you can live in a full 24hr working timetable for each route, perform a variety of duties, wander around and hunt for collectables, or stand at your favourite station and take in the day that unfolds. What’s your ideal day in Train Sim World?